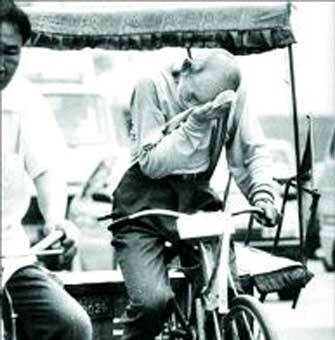 For almost twenty years, he paddled his tricycle earning Yuan by Yuan to save up for his donations. His lunch was two buns and plain water. Luxury to him was the sauce he put into the water. Dinner was a piece of meat or an egg. What he wore was what he picked from the dump. Any extra piece was luxury. 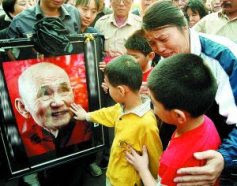 Pictures showing the students from Yao Hua School paying tributes to their benefactor. I too cried while reading his story. This is really the Power Of Giving. You are totally right. I cried while reading him. Thank you for reading my blog. No words to express but tears on my eyes.Yes, it's the greatness of a person I came to know whom I never forget next to my passed "SIR"
Selfless act... Wish our government officials here in the philippines learned from him, while they sit on their soft couch and spending peoples money on their nonsense luxuries (sometimes mistresses) they should be like him. He is true indeed an angel in disguise. I was also crying while reading the story. I'm glad he touched your heart. This is the best story I've read in my lifetime.. this is the true meaning of self-sacrifice, putting himself through such hardship day after day after day so he can help others. The way he disregarded his own welfare to help those children is without a doubt the greatest act of generosity and love I've ever seen. An angel on earth... I have no doubt he's with God in a place he won't ever have to suffer again. I share this story with my friends. 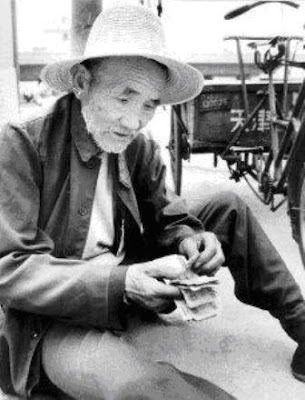 He is a real hero... An ultimate self sacrifice... A greatest act of generosity... Hope one day I could also have my last 500Renminbi to share.. I'm glad you are sharing this story to your friends. Feeling very emotional now... what a great man and soul to depart from this earth.. Thanks to you too for bringing this news to all ..
And thank you for reading this post. Thank you for reading my post. Please inspire your students too. Great personality is fang sir,,even wealtheir peoples does not courage to do this type of work. We are totally selfish.